Doka’s focus: understanding customer needs, customer-oriented thinking and creating added value for customers. All this is reflected in the exhibition presence at bauma 2016. "Doka made a commitment to building the lead in formwork technology. This is the reason we continue developing measures to boost construction efficiency and putting them into practice systematically. Firstly in formwork systems, and secondly in the technical services to go with them. Doka formwork solutions always come as a package that delivers tangible benefits to our customers", so Jürgen Obiegli, Chairman of Executive Board, Doka Group. At bauma 2016, Doka introduces its range of products and services in three areas with their own exciting themes. The World of Products presents products and services in accordance with a construction workflow: from foundation to regular floor. A special highlight are live product demonstrations with champions and runners up of the international apprenticeship competition World Skills. 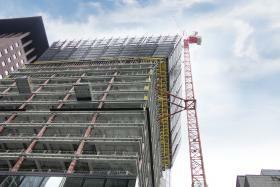 Doka demonstrates the high art of engineering in the World of Projects. Whether one is interested in tunnels, highrises, bridges or power stations, the right Doka Specialist for each sector is there with advice. Formwork sheets, formwork beams and floor props are on display in the World of Components. In the tough daily routine on the construction site, speed and efficiency are increasingly becoming the crucial success factor. Doka formwork systems are optimised precisely for these factors. In autumn of 2015, Doka started its "Forming even faster" campaign in Germany, Austria and Switzerland. It refers to three formwork systems with a proven record for faster forming times, lower wage costs and increased competitiveness. Visitors can experience it up close in the World of Products. Framax Xlife plus is the latest innovation of Doka's framed formwork. The revolutionary form-tie technology that can be operated from one side and has no wearing parts ensures an even faster work pace. All plus panels are equipped with the proven characteristics of Framax Xlife. At 1.35 m, their form-tie grid is wide. Compared to a 1.20-m form-tie grid, this means up to twelve percent cost-savings on form-tie points and form-tie hole finishing work. Form-ties are quickly ready to use when 'parked' directly at the form-tie point. Framax Xlife plus yields up to one third in time savings during forming and stripping. The panels consist of completely hot-dip galvanized frames and robust Xlife sheets. They are quickly combined horizontally and vertically. Dokadek 30 is a beam-less, hand-set formwork system designed as a lightweight steel construction faced with a wood/plastic-composite sheet. The system combines the advantages of a panel floor formwork system with those of Dokaflex floor formwork: its 3-m² panels make it fast in typical zones, yet – because it is easily combined with Dokaflex – it is also quick and flexible in the infill zones. It is erected working from the safety of ground-level without having to walk on the floor formwork. It takes users less effort to engage the panels in the prop heads and tilt them up safely from below, even with taller ceiling heights. Dokadek 30 has only a few panels that need moving; hence it scores with rapid erection and dismantling. Dokaflex 30 tec is a fast, versatile floor formwork for any desired layout. The system combines proven technology (floor props and secondary beam H20) with the heavy-duty Composite formwork beam I tec 20 as the primary beam. As a result, wider spacing between the floor props is permitted. Depending on application, the calculations yield up to 30 % fewer floor props, fewer individual parts and less weight. This in turn increases the work pace. At Doka’s booth visitors can expect to see two new Doka products. With the Load-bearing tower d3, Doka expanded its product portfolio for Southeast Asia and the Middle East. Additional market overseas introductions are already in the planning stages. The Load-bearing tower d3 is a product enhancement of a successful Doka load-bearing system and combines the benefits of existing systems. d3 is designed for particularly large shoring heights and high loads and ideally suited for building construction or civil engineering. The system combines speed and efficiency and its flexibility makes it suitable for versatile applications. The Doka UniKit shoring system is the ideal modular system for transferring heavy loads. With the modular system grid, large-volume load-bearing structures are produced quickly and easily. It allows for a variety of uses such as infrastructure and power plant builds. Doka presents the monolithic formwork system Doka OneGo at bauma as well. It is a system where walls and floors are cast in a single pour. It is Doka's response to the market's demand for creating cost-effective residential buildings in monolithic construction. The range of application spans from single family residences to apartment buildings through to residential highrises. Formwork technology is challenged most when building highrises, bridges, tunnels and power plants. Regardless of size and complexity of the construction project, Doka delivers a precisely fitting formwork solution that is custom-made for the individual building project. The World of Projects at the Doka Campus offers a platform where customers and prospects can discuss their individual and special challenges with Doka Specialists. The right contact is available for every construction sector. Customers profit from every-day experiences of Doka Experts and concrete insights from projects around the globe. Every construction site goes through its own process. Doka takes an all-encompassing view of the construction sequence and supports the customer through all stages of a construction project – from planning to execution through to completion. At bauma, Doka shows how the service portfolio supports customers in effectively implementing the forming task and beyond. Thorough, accurate planning is the basis for fast and safe forming operations. With the support of proprietary software such as Tipos and DokaCAD, 1,000 Doka Technicians around the world help customers reduce their own planning expenditures and with successful implementation. The customer portal myDoka offers first-class customer service. Using their PC or tablets, customers have convenient access to their project- and site-specific data at any time. An ideal interface with the Doka team. Apps too are available free of charge, including the Doka Tools app for calculating the optimum equipment quantities, the Doka quantities planner and the Dokadek 30 app with an augmented reality function. As part of the Pre-assembly on site, Doka offers assembly of load-bearing towers and formwork systems directly at the site by especially trained Doka staff. The benefits for customers: certainty of cost, schedule and quality. In case of special structural requirements or unusual shapes, Doka Pre-assembly Service can help. Customized formwork units are tailor-made directly at the Doka branch and delivered to the site. The innovative service of Concremote is already an indispensable partner on numerous construction sites. This technology enables real-time online measurement of both, concrete strength and temperature development. The concrete strength development, for example, enables users to calculate striking times, treatment times and prestress points. Measurement of thermal changes is important in order to monitor the stress caused by temperature differences in a component. This helps to prevent cracks and subsequent damage to the building. Concremote enables users to take the right steps on the basis of concrete strength measurements, and thus to secure and accelerate the building process. Apart from Concremote, Doka also presents the product enhancement Concremote plug.IN. Integrated directly into the Panel floor formwork Dokadek 30, Concremote plug.IN determines the correct stripping time. Safety is of utmost priority on the site. At Doka, safe solutions are an integral part of product philosophy and boost site productivity: they meet legal standards, help prevent accidents, assist with their speed and help comply with the schedule and also with completing projects below budget. A win-win situation – especially for users. In the World of Products, Doka demonstrates the broad range of safety systems directly on the exhibit. Whether working and protection platforms, guardrail systems, access systems or tie-rod systems, Doka safety systems yield financial benefits for construction companies in addition to being flexible and easy to use. Thank you for your interest - Welcome to the Doka Campus. Thank you very much for your interest - Welcome to the Doka Campus.